RAID 0 consists of striping, without mirroring or parity. 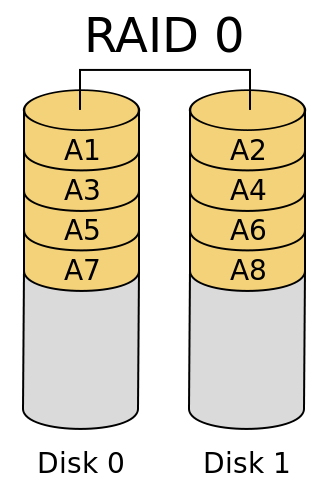 The capacity of a RAID 0 volume is the sum of the capacities of the disks in the set, the same as with a spanned volume. There is no added redundancy for handling disk failures, just as with a spanned volume. Thus, failure of one disk causes the loss of the entire RAID 0 volume, with reduced possibilities of data recovery when compared to a broken spanned volume. Striping distributes the contents of files roughly equally among all disks in the set, which makes concurrent read or write operations on the multiple disks almost inevitable and results in performance improvements. The concurrent operations make the throughput of most read and write operations equal to the throughput of one disk multiplied by the number of disks. Increased throughput is the big benefit of RAID 0 versus spanned volume.